Take advantage of this half-day cultural experience to learn about one of Japan’s oldest traditional sports, sumo! 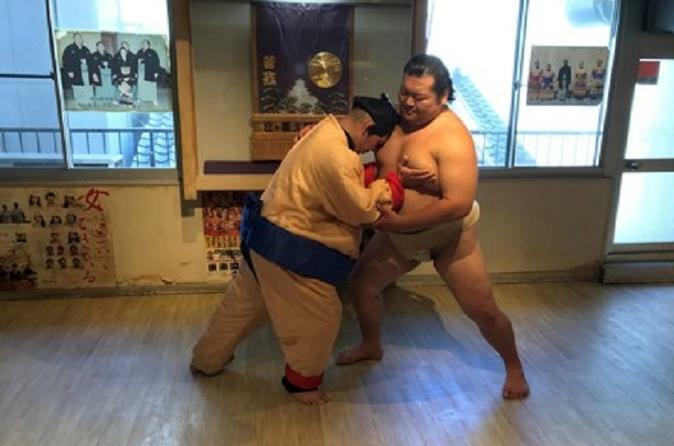 At this event, not only you can get to know more about the sport and watch a sumo demonstration, but also take pictures with the sumo wrestlers and challenge them to a match. The experience also includes a filling meal of Chanko-nabe, a high-protein dish which is a staple in the wrestlers’ diet. This event takes place on Mondays in Asakusa, and on Thursdays in Ryogoku. The event starts in Asakusa at 11:30am, or in Ryogoku at 11:45am. Please make your way to the venue with the indications you will be given at the time of booking. The first part of this cultural experience is the same for both locations. You are given a short lecture on everything sumo: history, movements, training and tournament wrestling. In the meantime, you can see these teachings put into practice in a 50-minute sumo demonstration, held by former professional rikishi – that is the formal name of sumo wrestlers. After the demonstration, you can take pictures with the wrestlers and even challenge one of them to a sumo match, if you are brave enough! Hopefully the match has made you really hungry, because it’s time for Chanko-nabe, served at both the Asakusa and Ryogoku event. This hot pot dish varies greatly in contents over seasons and locations, but generally contains udon noodles, meatballs, fish, tofu and various kinds of vegetables, and it’s eaten by multiple people from the same big pot. This dish is a staple in the sumo wrestlers’ diet as it’s full of proteins and helps them maintain their weight; many sumo wrestlers end up opening their own Chanko-nabe restaurant or have their own personal recipes! For this meal, Chanko-nabe is accompanied by various side dishes, which change according to the event's location. In Asakusa, rice, rikishi miso, salad, fried potatoes, yuzu sorbet and oolong tea will be served until June, while from June onwards, an individual dish of Tonkatsu (pork cutlet), bento box (salad included), sorbet and drinks will be served. In Ryogoku, Chanko-nabe is accompanied by the restaurant's signature Genghis Khan Bento Box and a sorbet. The experience will end at around 14:00pm at both locations.